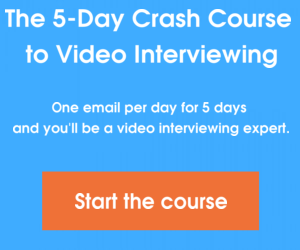 How Do I Video Interview... Unemployed Candidates? Every candidate comes with their own set of unique interviewing challenges. That’s why we’re tackling how to video interview different types of job seekers with this how to series. Today, we’ll be talking about how to connect with unemployed candidates in the video interview. Too many companies automatically discount candidates who are currently without a job. But perhaps these unemployed candidates are exactly the kind of motivated job seekers you need in your organization! With the tough economy, unemployment is a huge problem right now. At 7.9 percent, the U.S. has the lowest unemployment rate in years. But 7.9 percent unemployment is still very, very high. And not all of these job seekers have been out of work for only a short amount of time. In fact, numbers from the Labor Department show nearly 4.8 million Americans have been out of work for a staggering 27 weeks or more. This is a big portion of job seekers to leave on the table just because they’re not currently employed. Many companies, however, are ignoring this huge segment of the talent pool. A recent study for the annual Academy of Management conference showed just one month after being let go, job seekers were facing an uphill battle to get hired. The study proved employers rated identical resumes more positively if candidates were still at a current position. It’s hard enough for unemployed candidates without companies discriminating against them because of their jobless status. These workers are not only a big segment of the talent pool, but also they’re a highly motivated segment. While passive candidates are great, unemployed candidates are more likely to be excited and ready to jump in and hit the ground running. There will be no decision process about whether they should leave their current comfy cubicle for your greener pastures; unemployed candidates will be ready to work as soon as you make an offer. The video interview is the moment to put your doubts about a candidate’s unemployment to rest. Don’t feel strange about asking what might feel like awkward questions. If it’s something you feel you need to know to move forward with the job seeker, then you should utilize the video interview to ask. Why were you let go? If your job seeker is wading into the unemployment pool thanks to downsizing or firing, it’s important you get the full story before making a job offer. Perhaps the economy caused the job seeker’s company to let go of talented workers. Or perhaps the job seeker was fired for some offense or mistake. Find out what the reason was straight from the source before making assumptions. What have you been doing? Bouncing back after being let go is tough, whether you were downsized or fired. But you’re looking for job seekers who stopped wallowing and started getting proactive. Asking about what the candidate has been doing during their unemployment is a good way to gauge motivation and drive. For instance, maybe they’ve been volunteering their skills and building up their network. Or maybe they’ve been working on a contract or freelance basis. Don’t make the mistake of thinking just because these job seekers don’t work a traditional 9-to-5 job means they haven’t been working at all. What have you learned? The best job seekers will be the ones who have learned valuable lessons from their experience. They might have learned the importance of networking or even went out and got additional credentials and education. Asking what they’ve learned from their unemployment is a good way to find out if the job seeker is the kind of employee who will look at big problems as learning opportunities and challenges to be solved. Unemployed candidates certainly aren’t unemployable, and they might be just the talent you need for your organization. So use the video interview as a window to ask smart interview questions and find out if these candidates are the right talent for your organization. What interview questions do you ask unemployed job seekers? Share in the comments!